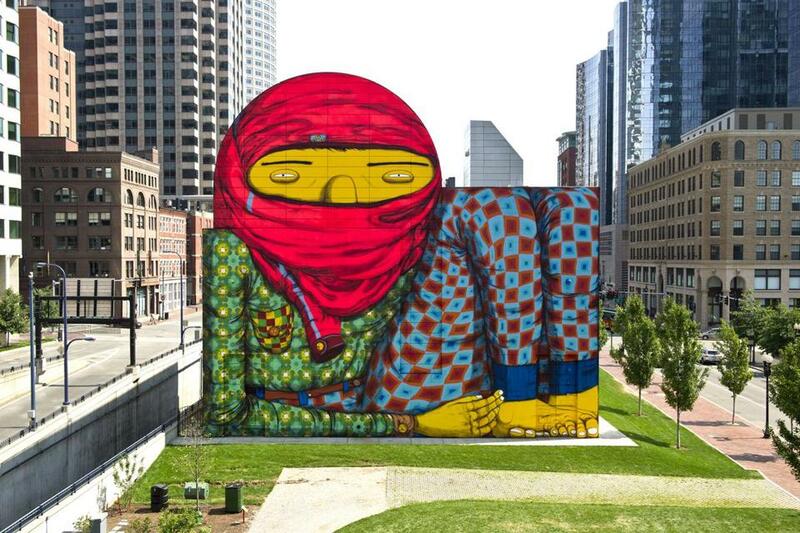 The Os Gemeos mural on the Rose Kennedy Greenway at Dewey Square. Of all of the pieces of public art that have recently come to Boston, the mural towering over Dewey Square, painted by the Brazilian graffiti artists known as Os Gemeos, has been one of the most striking and controversial — and thus the most important. The picture of a boy in colorful pajamas, though misinterpreted by a few as an image of a terrorist, has breathed visual life into a well-traveled part of town and launched intriguing public conversations. Yet the fact that the Rose Kennedy Greenway Conservancy plans to take it down at the end of the summer is good news — not because the mural won’t be missed, but because that space, on the face of a seven-story-tall ventilation building at the corner of Summer and Congress Streets, is too important to leave static. The existing mural was timed to coincide with an Institute of Contemporary Art exhibit on the Brazilian painters. But its colors have faded. Now, the Greenway Conservancy plans to collaborate with the ICA to propose a new mural that would fill the space for another year. Let’s hope they — and the Boston Art Commission, which oversees public art in the city — aren’t fazed by last year’s controversy over the Os Gemeos mural. Everyone involved should recognize the importance of highlighting artwork that is interesting and bold and makes clever use of an irregularly shaped space. The tie to an ICA exhibition — and the expertise of that museum’s curators — was helpful last year and could be again. Regardless, the mural should reflect a distinct artistic vision, not the watered-down consensus of a government committee. Whatever the new piece, here’s hoping it sparks as much interest among people passing by as the one that came before it.